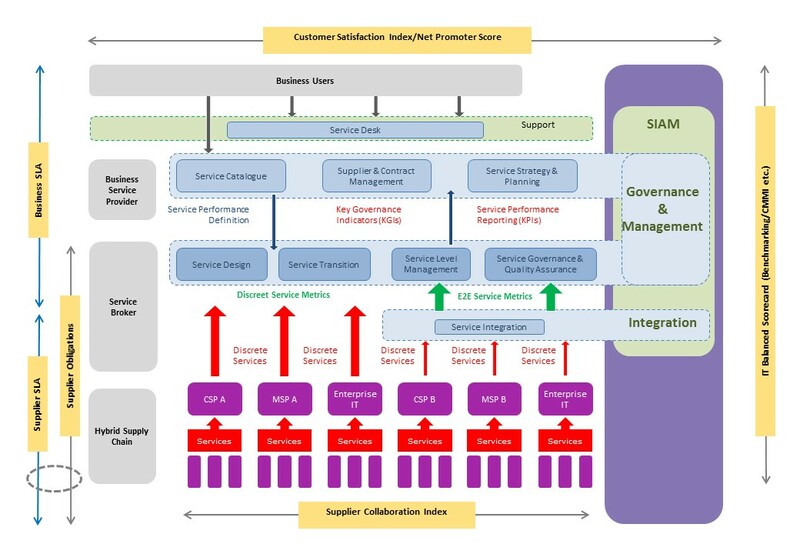 The diagram below is one I have used to illustrate the idea of a 360 Degree view of service performance in a SIAM or Hybrid-IT operating model. This uses 4 dimensions to represent how a more complete view can be achieved using different approaches and techniques. Dimension 1: Along the left hand side top down you have the traditional SLA perspective from the business to the supply chain. A key thing to note here is that the SIAM function will need to add SLA obligations and metrics that will enable a contracted service to be "manageable" by the SIAM functions. The degree of manageability will of course vary but this is where it gets defined and embedded into supplier contracts. Dimension 2: Along the bottom you have a collaboration framework that measures how well the supply chain collaborates with each other. This is the hardest to implement and manage, in its simplest form it will create a collaboration index that represents how well a supplier collaborates with others in the IT Supply Chain - more in this in another post! Dimension 3: Along the top there is an internal business view that measures how well Enterprise IT is performing from the perspective of business users who consume the services provided. This may be measured and tracked using internal SLAs, or customer satisfaction surveys such and net promoter score. Dimension 4: Along the right hand side top down is the Enterprise IT performance management perspective that IT will use internally to measure its maturity and performance. This will use traditional balanced scorecards, performance dashboards and maturity models (such as CMMI).